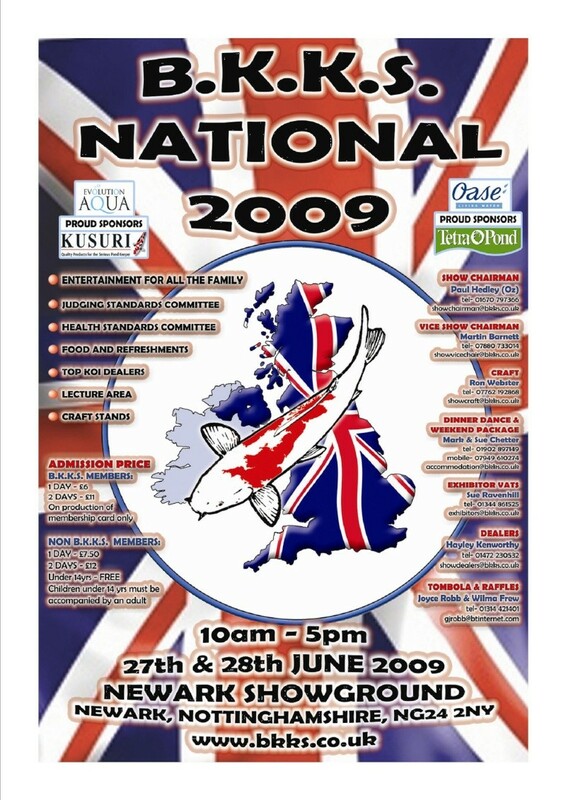 The BKKS National Show is again based at the Newark Showground and will be held on the 27th & 28th June, 2009. We are preparing for some amazing competition from our members, as we strive to encourage everyone to improve their Koi keeping skills so that their living jewels are at their sparkling best in time for the Premier Show of the year. The Dinner Dance package has been kept the same as last year following its success, off site as it were, in Lincoln. We trust you find this satisfactory and hope that you will support the fund raising events that are being planned. As far as feeding the inner self is concerned we have managed to secure an indoor venue adjacent to the Show ring, note you will not leave the vicinity of the Main Show. There will be a selection of hot and cold food on offer from the main showground caterers as well as from the 'chuck' wagons (but to a lesser degree than last year). We are also using the site caterers adjacent to the main ring, hot meals will be available and we will be able to provide some liquid refreshment, other than tea and coffee, for those who do not have to drive home due to having negotiated a 50 / 50 agreement with their partner. The Lecture Theatre is again being well supported by potential speakers and once we have confirmed who we have secured we will let you know. This also applies to the dealers and craft stands and once we have a clearer picture of who will be attending the show we will let you know. We are working hard to bring some family entertainment to the main ring for you but this is still in the early stages of development, so watch this space for more updates. One last favour - please keep your fingers crossed for good weather - if we start soon enough we may just get our wish. Well we are going along to them this year! as we have never been to it before, heard quite a bit about it so have decided to check it out. I think the plan is we go on Saturday stay over then do the show on the Sunday! I have heard not sure if this is true that the Sunday is the better day to go. See you there on the Sunday. Can I just point out if anyone is planning on stopping over the weekend of the Nationals you really need to move quickly! I have been on the phone all morning and cant get booked up! Most places are full as there is a dance festival on that same weekend and the hotels are full with Germans and Russians. valleykoi wrote: See you there on the Sunday. sheryl wrote: I think the plan is we go on Saturday stay over then do the show on the Sunday! I have heard not sure if this is true that the Sunday is the better day to go. I will have a look round that area! Not too much booze on Sat. I`ll Have the Valley Koi top on. Now why didnt i think of that! Hoping to make this a busy weekend.Meeting Chris from Koi Masters Advantage in Barnsley first and then onto the show.